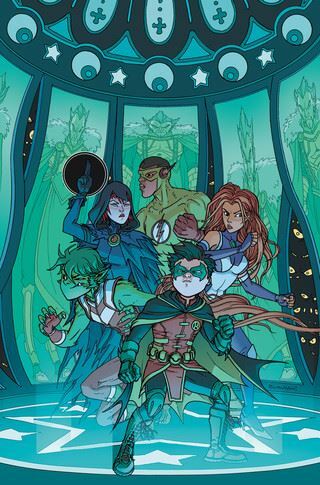 Damian Wayne remains firmly at the core of the story in Teen Titans #3, although this book is not like Titans. The rest of the team get opportunities for characterization and development, if not action, in this story. We also get to see more of the Demon’s Fist, the group of junior assassins that Damian was raised with, and who his grandfather, Ra’s Al Ghul, has dispatched to take out the Teen Titans. But where the issue really takes off is in the conversations that Damian, Starfire, Raven, Kid Flash and Beast Boy have with each other. In these scenes the differences among the members of the team become clear. It’s an interesting variation that, aside from Damian, the two most serious people on the team are the women, Starfire and Raven. Kid Flash is bubbling over with excitement and eagerness, while Beast Boy remains true to the way his character has been portrayed for the past thirty plus years, as a jokester who uses humour to cover the pain he feels about his past. The are a number of really nice touches in their conversations. Starfire’s rage at the very thought of being enslaved. Beast Boy stating his power as “super sexiness,” and Damian confessing that his arrogant and manipulative behaviour is because he really doesn’t know how to be a friend or a good person. The story ends with Damian making a sacrifice that, frankly, seems a bit out of character, considering that he has only been dealing with these teammates for a couple of issues so far. But it does serve as a good tease for the next issue.